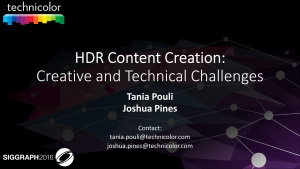 Tania Pouli and Joshua Pines, ‘HDR Content Creation: Creative and Technical Challenges’, SIGGRAPH Course, SIGGRAPH 2016. Tania Pouli, Douglas Cunningham and Erik Reinhard, ‘Natural Image Statistics: Foundations and Applications’, Eurographics 2013 Tutorial. 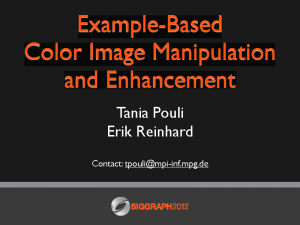 Tania Pouli and Erik Reinhard, ‘Example-Based Color Image Manipulation and Enhancement’, SIGGRAPH Course, SIGGRAPH 2012. 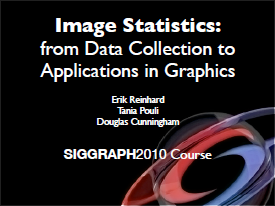 Erik Reinhard, Tania Pouli and Douglas Cunningham, ‘Image Statistics: From Data Collection to Applications in Graphics’, SIGGRAPH Course, SIGGRAPH 2010.